ABUJA, NIGERIA (THIS DAY) -- The federal government wednesday approached the Federal High Court in Abuja, for an order to temporarily freeze properties and assets linked to the Deputy Senate President, Senator Ike Ekweremadu. The suit which was filed on behalf oaf the federal government by its solicitor, Festus Keyamo (SAN), was brought pursuant to section 330 of the Administration of Criminal Justice Act, 2015 and section 8 of the Recovery of Public Property (Special Provision) Act. In the suit marked FHC/ABJ/CS/284/2018, the applicant, (Special Presidential Investigative Panel for the Recovery of Public Property) is seeking the order of temporary forfeiture of the said properties pending the conclusion of its investigation. The applicant is therefore asking for “An interim order of this Honourable court temporarily attaching/forfeiting the properties listed in schedule B hereunder to the federal government of Nigeria pending the conclusion of further inquiry/investigation by the Special Presidential Investigative Panel for the Recovery of public Property and or possible arraignment of the respondent. “And for such other orders as the court may deem fit to make in the circumstances of the case. “Some of the grounds on which the application is predicated are that the properties listed in schedule A were the properties declared by the respondent in his asset declaration forms at the Code of Conduct Bureau (CCB). “That ongoing investigation/inquiries have revealed that the properties listed in schedule B also belong to the respondent and so belong to him when he declared his assets in schedule A. “That preliminary investigation by the applicant reveals that a prima facie case of breach of Code of Conduct for Public Officers has been made out against the respondent. In a four paragraph affidavit deposed to by one Yohana Shankuk, a clerk in the Chambers of Festus Keyamo, the plaintiff stated that the order is necessary to forestall any frustration of the investigation of Ekweremadu by the panel. 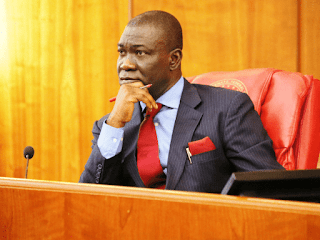 The Special Presidential Investigative Panel, headed by Okoi Obono-Obla is accusing Ekweremadu of not making full disclosure of his assets as required by the rules of a public officer. Properties declared by the deputy senate president in schedule in his asset declaration form as at June, 2015 include those scattered all over the world including, Nigeria, United Arabs Emirates, United States. However, Ekweremadu yesterday said there were no assets to be forfeited to the federal government as he declared all his assets with the CCB as required by law. In a statement signed by his Special Adviser on Media, Uche Anichukwu, the deputy senate president said the panel sought and obtained his assets declaration forms, but could not look at them since it was out on a vendetta and smear campaign championed by Obono-Obla. He assured all his supporters and well-wishers that there was nothing to worry about, adding that like others, this too would pass.